CPS Energy is saying goodbye to its historic W.B. Tuttle natural gas plant, which after World War II became a key component to meeting energy demand for a booming San Antonio population. Stephen Tips, a generation projects manager who worked at Tuttle and is now spearheading the decommissioning effort, led a final tour of the plant, located on 334 acres on Perrin Beitel Road. Tuttle’s first unit had to be brought online ahead of schedule in June 1954 to help meet that summer’s peak energy demand. At a dedication ceremony six months later, the plant was officially named in memory William B. Tuttle, who served more than 40 years in roles that included general manager and president. Retiree Louis Sengele, who worked as a shift supervisor when Tuttle first came online, has fond memories of working at Tuttle and other plants during his 45-year career, but said it was no walk in the park. Louis Sengele, who retired from CPS Energy in 1993 with 45 years of service, was a production shift supervisor and the first employee to bring the Tuttle Plant online. Aside from the hot working conditions, employees also had to take readings of equipment by hand since there were no computers in the early days. The rural setting at Tuttle was a contrast to the older Mission Road power plant located just south of downtown. 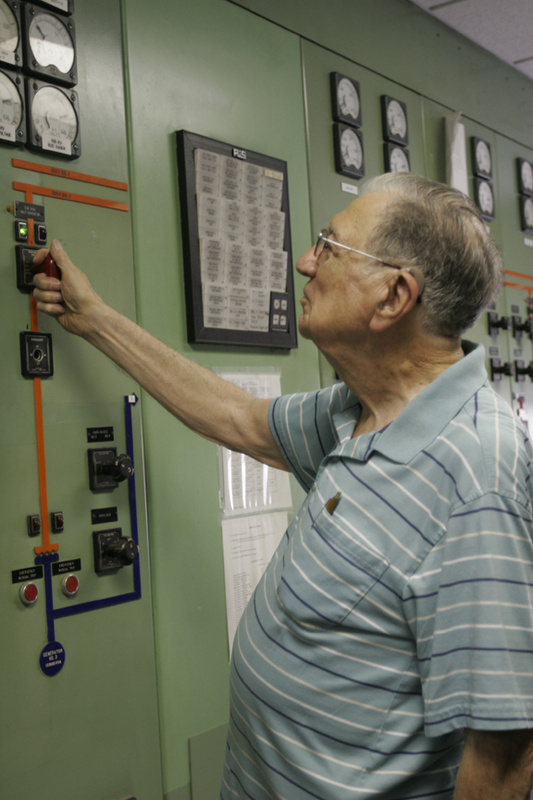 Much like CPS Energy’s retirees, the Tuttle units served Greater San Antonio for decades. The number of generating stations at the site increased as the city’s population expanded. Three subsequent units were constructed, the last in 1963. Over the years, CPS Energy began relying on bigger, better and more-efficient power generation sources, including nuclear power and coal, as well as sustainable sources like wind and solar. By 2010, Tuttle was simply no longer economically viable to operate. The plant is scheduled to be razed by the end of next year. While there are no concrete plans for the soon-to-be-cleared site yet, one possibility is to build smaller, quick-starting “peaking” natural gas units, similar to those in operation at Leon Creek and Braunig power stations. Those plants are fired up on the hottest summer days, when demand is at its highest. Check out this slide show of historic Tuttle photos on CPS Energy’s Flickr page.